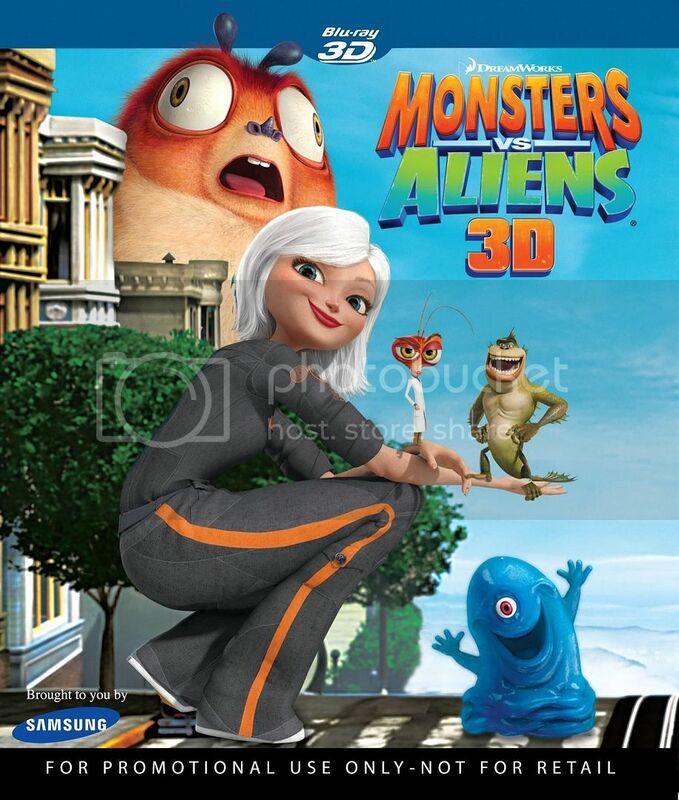 Monsters vs. Aliens is the first title available on Blu-ray 3D, exclusively in a Samsung 3D starter kit. The 3D Blu-ray release features both the 2D and 3D versions of the film with 1080p AVC/MPEG-4 video presentations, and I’ll touch on both versions of the film. 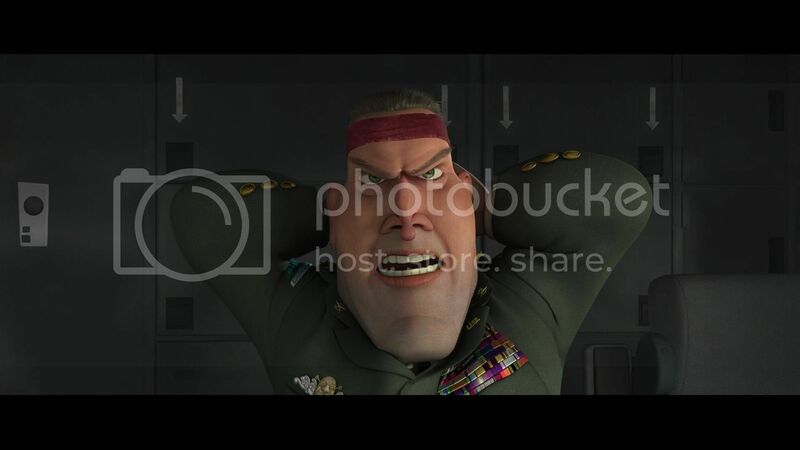 The disc itself would not load on my computer for some reason, but the high-def encode of the 2D version of the film appears identical to that on the regular Blu-ray release. No surprise the film looks terrific, with the presentation leaping off the screen from beginning to end. Detail is top-notch and colors are absolutely beautiful. Now to what matters, the 3D version of the film. The 3D version of the film is definitely impressive but is also not without its issues. 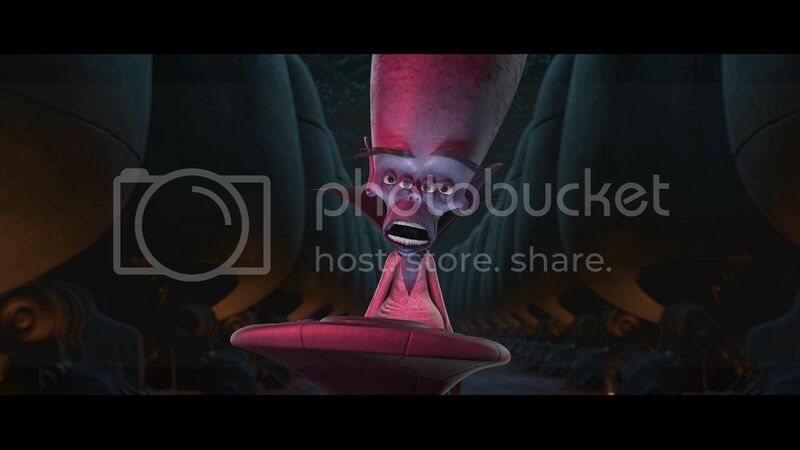 You will notice that the 2D and 3D versions of the film feature different aspect ratios. The 3D presentation of the film is quite impressive as a whole, particularly viewed at my home rather than a Best Buy demo (which I found less impressive, mostly due to the lighting and the thought of wearing glasses worn by possibly hundreds of people). Detail levels are fantastic and colors stay surprisingly vibrant (I definitely expected them to be much darker than they are here, like theatrical 3D viewings). However, I did find myself annoyed by the ghosting present on the Blu-ray release. The ghosting on the Blu-ray release is not a constant thing, but when it is present it definitely clear. I absolutely hate ghosting and it constantly bothered me with previous 3D formats, unfortunately I do think certain moments could have looked better had they taken the time to fix the ghosting issues. While the ghosting was definitely a turn-off, I am still very impressed by the 3D quality of the presentation. The upgrade from previous 3D home video formats is amazing and you will instantly appreciate and love the difference. Monsters vs. Aliens may have 3D video issues at times, but this is definitely a strong first effort from Paramount Home Entertainment. The presentation definitely could have been worse and the release will likely be free for anyone who purchases a Samsung 3D bundle. 8/10. 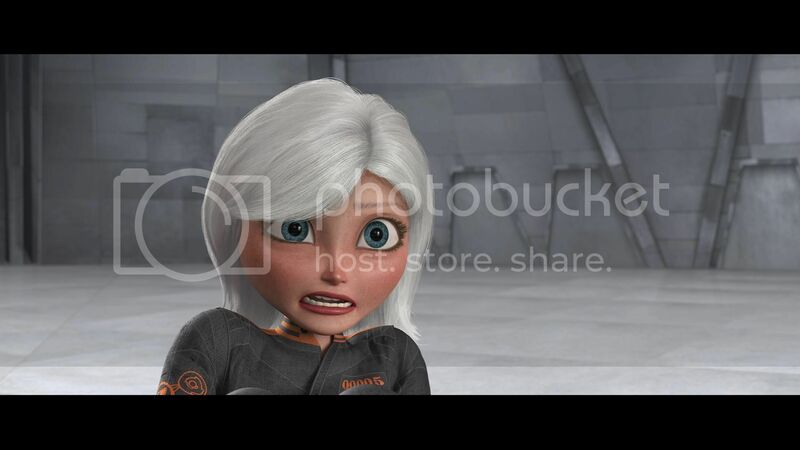 While the regular Blu-ray release of Monsters vs. Aliens includes a 5.1 Dolby TrueHD audio track, unfortunately that is not the case for the 3D Blu-ray release. The 3D disc actually includes the following 5.1 Dolby Digital audio tracks: English, Spanish, French, German, Italian, Korean, Chinese and Portuguese. Optional subtitles include English, Spanish, French, German, Italian, Korean, Chinese and Portuguese. This is extremely disappointing. Lossy audio? Paramount, this is Blu-ray and it is almost insulting to include outdated audio technology for something that takes quite the investment to get your hands on. I wish I could say I was impressed by the 5.1 Dolby Digital track, but I honestly am not. The 5.1 Dolby Digital audio track while certainly active, lacks that oomph that came with the 5.1 Dolby TrueHD audio track on the regular Blu-ray release. While the 3D video presentation helps sooth the pain, this could have been a VERY immersive presentation if they did it right. Unfortunately that is not the case. I am personally disappointed, but I don’t think everyone will be. I guess I just expected better for a new 3D technology. 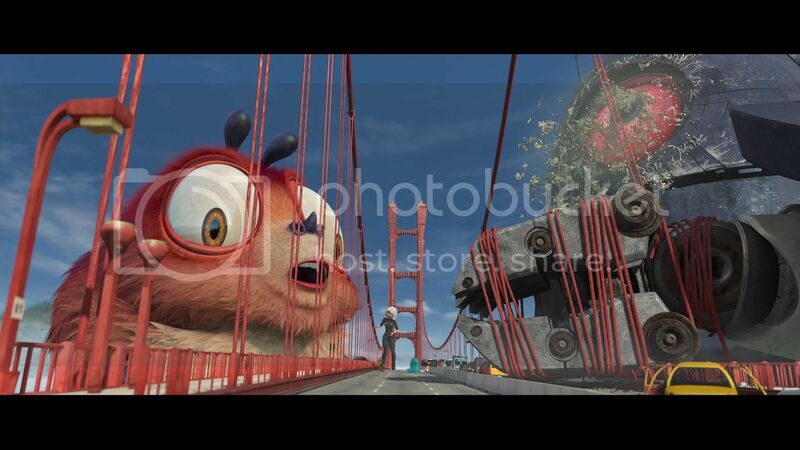 The upcoming Blu-ray release of Cloudy with a Chance of Meatballs includes SEVERAL high-def audio tracks and both versions of the film; I don’t know why Paramount couldn’t make that happen too. 5/10. A Blu-ray 3D version of B.O.B’s Big Break is included, clearly an improvement from the anaglyph 3D version included on the regular Blu-ray release. In fact I actually found this short to be more impressive in 3D than I did the actual film, perhaps because the content was clearly made to pop out of the screen. Gimmicky I know, but it was neat. Yes, that is all that is included on the 3D Blu-ray release. I believe there are a total of nine bonus features missing from the 3D Blu-ray release that are included on the regular Blu-ray release. Perhaps Paramount/Dreamworks have plans to re-release the Blu-ray release once their Samsung exclusivity deal is over? Maybe. 3/10. 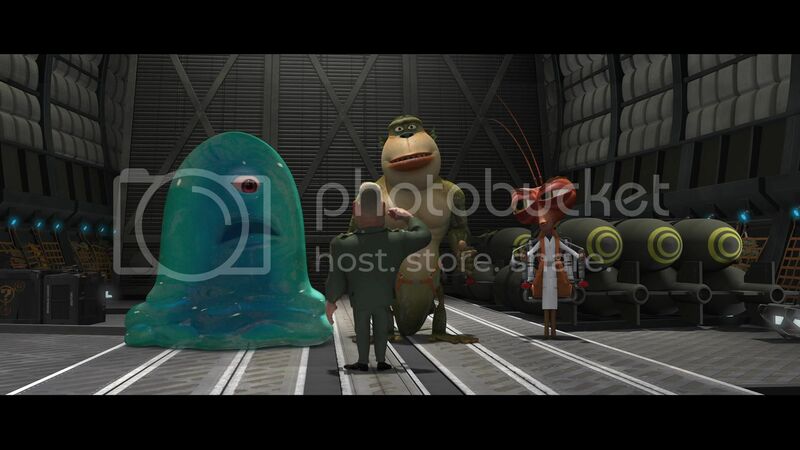 Monsters vs. Aliens is definitely not going to be a favorite for everyone, but I did enjoy it very much. The characters were very unique and fun, and the story was generally solid. I certainly enjoyed it more than other previous Dreamwork releases. While the movie doesn’t compare to films from Pixar, there is definitely plenty of heart and fun to be had. The 3D Blu-ray release is impressive in certain aspects and disappointing in other aspects. The video presentation of both the 2D and 3D versions of the film is impressive while the lossy audio included is extremely disappointing. The lack of bonus features only makes this release less enticing. If you are going to buy a Samsung 3D television bundle than it is a nice addition, but I certainly wouldn’t buy a setup for this title alone as it could have been better in certain areas. Overall though, I would definitely say it is ‘A Nice Addition’ to those thinking about buying a Samsung 3D Starter Kit.